I have a closet full of turtlenecks and this one will be on my favorites list when cooler weather rolls back around. It's very stylish, love the long length that I pair with a chain belt, hung loosely around my waist with skirts and slacks. I purchased 3 of these at different times.They are beautiful and wash beautifully. They are true to size and I would recommend these.Once again Thank you Diane! I wore the navy blue and havent washed it yet. I love the fit, length and feel of the fabric. It is a very classy turtle neck. I ordered a small and a medium and both fit well. I am keeping both. I hope it stays in the same condition after several washes. This is a nice soft sweater. It looks good even after washing (delicate cycle) air dry and 10 minutes in dryer at low setting. Its long enough to cover my rear. This is not big and oversized (wish it was I loved Dianes oversized turtlenecks from a few years ago)And it is not too tight (not body-hugging). Be chic while staying cozy with Iman's basic turtleneck. It's one of those must-have items for your fall and winter wardrobes. 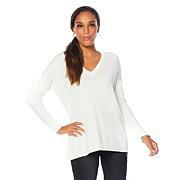 What a great layering piece for transitioning throughout the seasons.